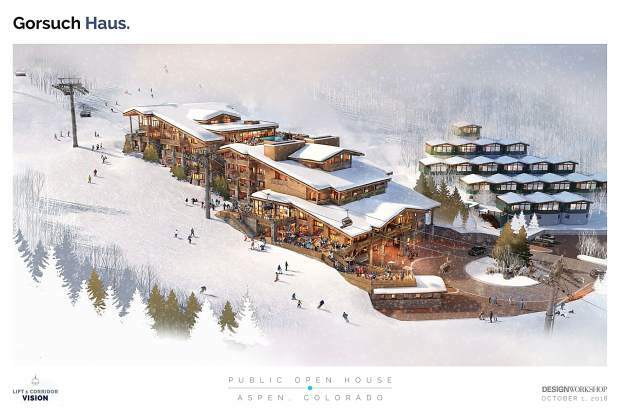 An architect's rendering of a new 81-room Gorsuch Haus hotel and a World Cup finish area at the base of Aspen Mountain. This holiday weekend marks the third consecutive year that Aspen is not hosting the FIS Ski Women’s World Cup races, and it will be several years before it’s even a possibility again. What’s hanging in the balance is the public’s approval of a redevelopment plan for the base of Aspen Mountain’s west side and a new telemix lift, with gondola cars and chairlifts. The last time Aspen Mountain was the host of World Cup ski racing was in March 2017 when the finals were held. Since then, officials from the International Ski Federation (FIS) have said publicly the old Lift 1A double chair is not suitable for World Cup racing. 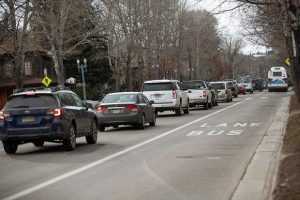 “FIS has made it clear that they want a new lift and a new base,” Jeff Hanle, vice president of communications at Aspen Skiing Co., said earlier this week. 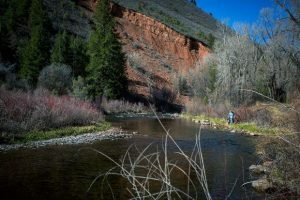 In response, two development groups who own land on Aspen Mountain’s west portal, along with Skico and the city government, which also are landowners in the area, have come up with a ski corridor plan that is currently under review by Aspen City Council. 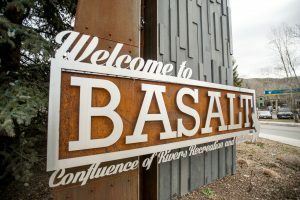 If approved, the two lodge properties, a new Lift One, a ski museum and a new bar and restaurant, as well as public parking and ski lockers and other amenities, will go to city voters in March. The next public hearing and review for the Lift One corridor plan is Monday night in City Council chambers in City Hall. Skico officials and planners estimate that in a best-case scenario, a new lift is installed and development is complete between three and five years. David Corbin, Skico’s vice president of planning, said it’s possible that the current Lift 1A would be out of commission for only one season and then the new telemix would be ready to operate the following year. He said if everything falls into place, of which there are many moving pieces, it could be 2023 when a new lift is operating. Jennifer Phelan, deputy director of the city’s planning department, said if voters approve a project in March, it would take a year for developers to complete construction and engineering documents and obtain building permits. Then it would be another estimated 20 months for construction, if there are no delays. Hanle said Skico isn’t planning on making a bid for World Cup racing while so many balls are in the air, but it is an event that Aspen-Snowmass wants back. 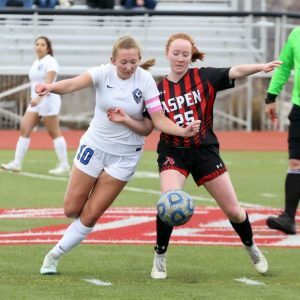 Aspen Mountain has been the host of the women’s races on Thanksgiving weekend since 2000, with the exception of 2003 and 2013 when the races were temporarily moved to test ski areas for the world championships. When the slalom and giant slalom races didn’t return in 2016, Killington, Vermont, picked them up and is hosting them this weekend for the third consecutive year. Killington is benefiting from the international exposure of ski racing and also seeing high attendance at the races because of its proximity to urban areas. Aspen didn’t rely as much economically on the women’s races over Thanksgiving weekend, but the exposure and honoring the town’s rich ski-racing history is void at the moment. He estimated that between 200 and 300 people associated with the races — coaches, racers and FIS officials — would come to town, spiking the occupancy around 10 or 15 percent. But lodge rooms were comped by local properties to support ski racing and the resort community, said Donnie Lee, general manager of the Gant Condominium Resort and board chair of the Aspen Chamber Resort Association. That’s why even though Aspen hosted World Cup in November 2015, lodging occupancy shot up 55 percent for the same month in 2016. Lee said there hasn’t been an immediate impact on business since the World Cup races left, but over time, there will be. “The impacts of this are slower moving and are longer term,” he said. Lee noted that business has been good even when the races weren’t here the past couple of years. Hanle pointed out some silver lining in that Skico was able to open Aspen Mountain early with good conditions because snowmaking resources weren’t focused on getting the race course ready on the west side of the ski area. Lee said it’s all about the PR value in the messaging. “Skico did a great job opening early,” he said, adding he hopes the Lift One project gets approved. “We have a rich history of racing, so as a community we embrace it.